Marvelous Marianne’s products, made from true green ingredients, were invented for many uses. Artists love them! Marvelous Marianne’s products are available at your local art supply retailers or check our To Order page for retailer locations. 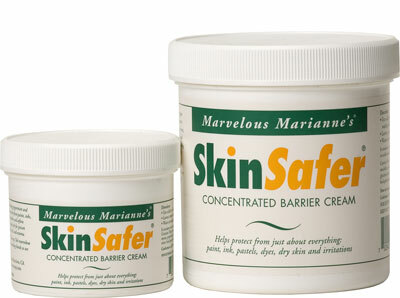 Marvelous Marianne's father-in-law, a doctor, swears SkinSafer is the best salve he's ever used. "My hands are exposed to chemicals," wrote a hairdresser. "SkinSafer makes them soft & smooth and protects clients' skin from tints & perms"
"It guards against poison oak and ivy," said a hiker, and "provides relief from itching and irritating insect bites and even chicken pox." Women everywhere tell us, "SkinSafer makes my feet and elbows look years younger."